This knowledge base article is related to Recruiteze: Applicant Tracking System. If you are not a Recruiteze customer, Recruiteze is a small company applicant tracking system to manage your entire hiring process online. With Recruiteze, you can post and publish jobs to job sites like Indeed, ZipRecruiter, Google and numerous other job sites. 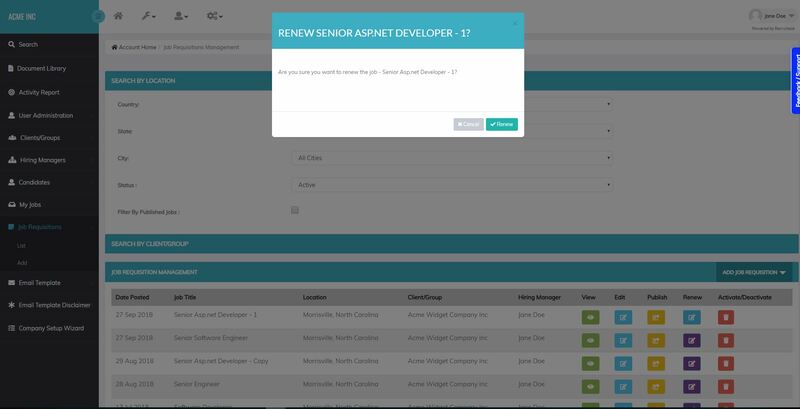 You can manage your applicants, candidate database, communication and notes in one simple interface. We have recently upgraded the legacy bulk email feature. The new feature is more robust and performs better. The bulk email feature is only available with the paid plans. The only limitation at this point, is you cannot send to more than 300 recipients in one email. Image below shows the “Contact All” button in the My Candidates view. This button is available from all the views mentioned above. From the contact all dialog, you can pick a different email template, change the from user, select a job to fill in the details or change subject and email body. The one thing that should not be changed is “@candidatefirstname“. This substitution keyword should be retained as is. If it does not exist, this should be added in the email body at the appropriate place. This will help our bulk email engine to replace the substitution keyword with the candidate first name, so that a personalized message goes out to each candidate in the selected list. Once you update your all the required fields the from, subject and email body. Clicking on send will send the email to all the candidates in the list. The “Contact Selected” button, will show up only if candidates are selected using the checkbox in the list. 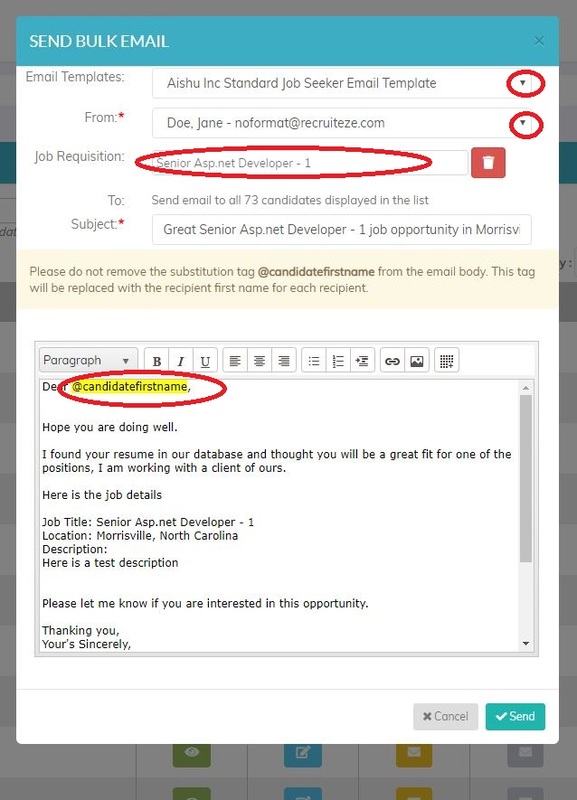 Image below shows how to select specific candidates to send emails. Clicking on the “Contact Selected” button will popup the send bulk email dialog shown earlier. From here you can update the fields and send the bulk email to the selected recipients. Thanks to our users for the feedback we have received. If you have any questions/suggestions/feedback, please send an email to support at recruiteze dot com. Recruiteze has been named the 2018 best small company applicant tracking system for ease of use and value for money, by Capterra. With Recruiteze you can manage your career’s page, custom applications, jobs, candidates, communication and notes easily and efficiently. It offers great recruitment continuity, far more efficient than spreadsheets. Try Recruiteze free today! This article pertains to Recruiteze: Applicant Tracking System. With the “Renew” feature, you can renew the job quickly. When you renew a job, the job posting date changes to the current date and the post expire date is extended for another 3 months, the job is also made active. Upon confirmation, the job is renewed and will appear at the top of the list. If you publish a renewed job, it is as good as posting a new job. You will start receiving applications. Thanks to our users for the feedback. Please send us an email to support at recruiteze dot com, if you have questions/suggestions/feedback. If you are not a Recruiteze customer. Recruiteze is the best small business ats, which allows you to manage your hiring process smoothly and efficiently. With an average job posting receiving 250 applications, it is best to use an applicant tracking system to manage your jobs, applications, candidates, communications and notes. Try Recruiteze free today! This help article pertains to Recruiteze: Applicant Tracking System. 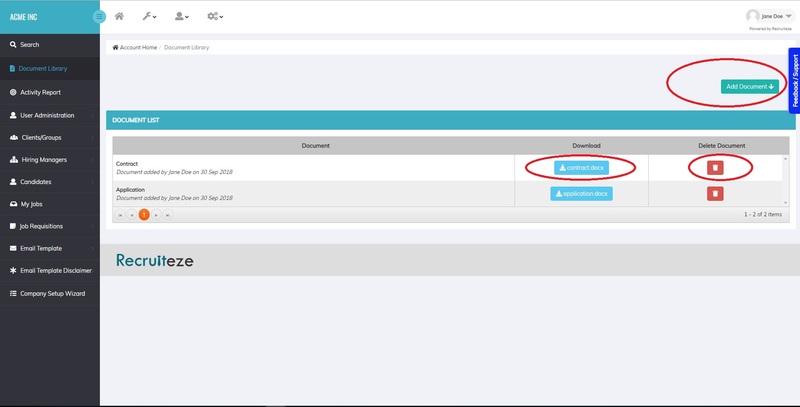 We released the document library feature, this will help you manage your documents in the system. Also associate it with email templates and emails. You can access the document library feature from the left menu like shown in the image below. Once you click on this menu, you can see a list of documents if you have added them or you can add a new document to the library. Image below shows the document library page. Add Document – Allows you to add a new document to the document library. Download – Allows you to download a document from the library. Delete – Allows you to delete a document from the library. When you delete a document, its association is removed from the email templates. You have to select a document, provide a title and save the document. It will be added to your document library. 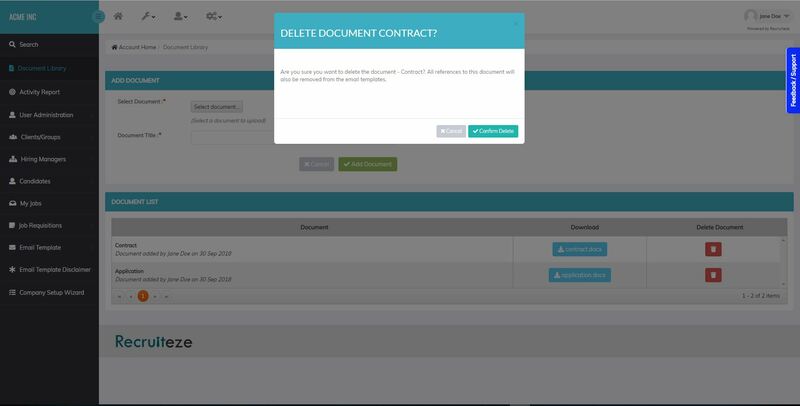 If you confirm, then the document will be deleted and any relationships with email templates will be removed. Thanks to our customers, for providing feedback. Please send an email to support at recruiteze dot com, if you have questions, suggestions or feedback. If you are not a Recruiteze customer. 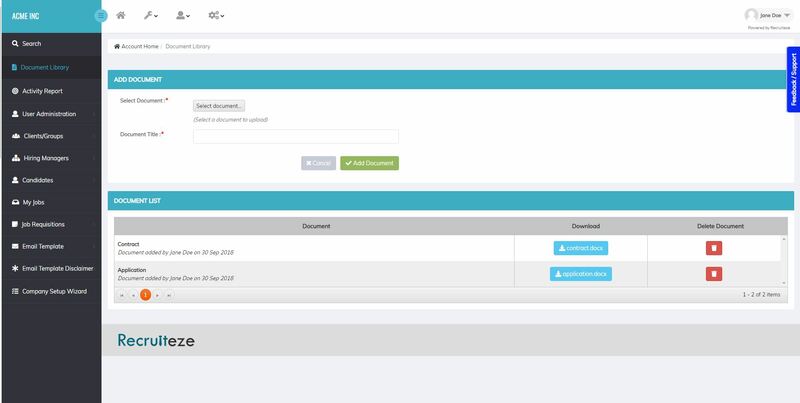 Recruiteze is a simple modern small business applicant tracking system. With Recruiteze, you can post your jobs to job boards, track your applications, manage your candidates and communication in one simple interface. Try Recruiteze free today! 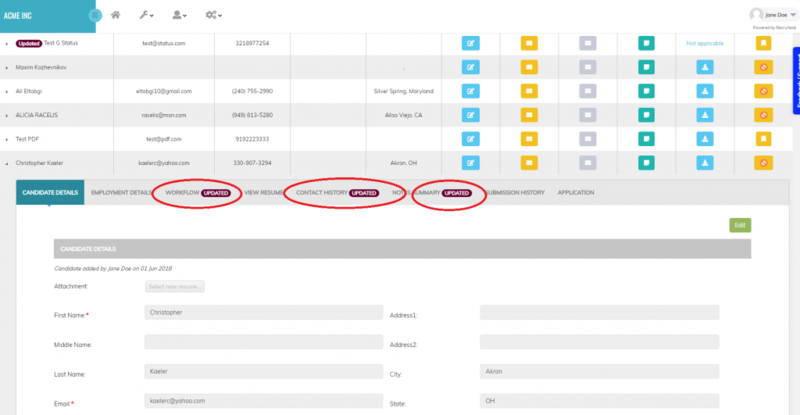 This knowledge base article is for Recruiteze: Applicant Tracking System. 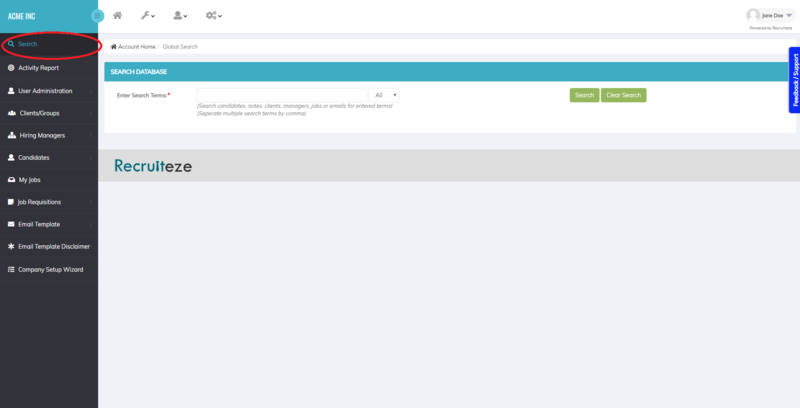 Recruiteze has a new feature, that will allow you to distinguish between new and updated candidates. If you are not a Recruiteze customer. 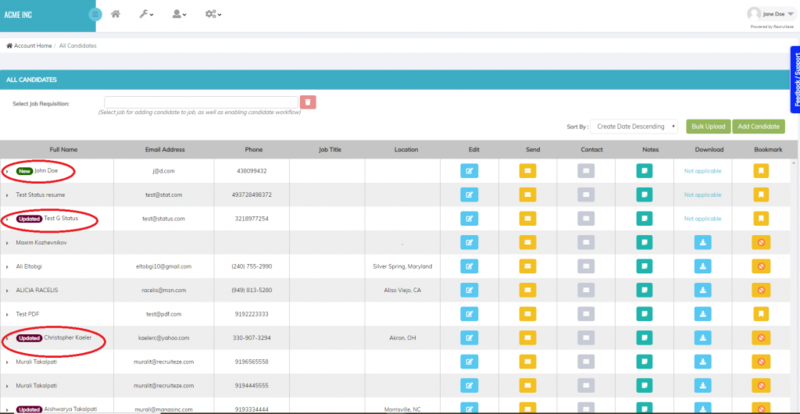 Recruiteze is an applicant tracking system for small business. 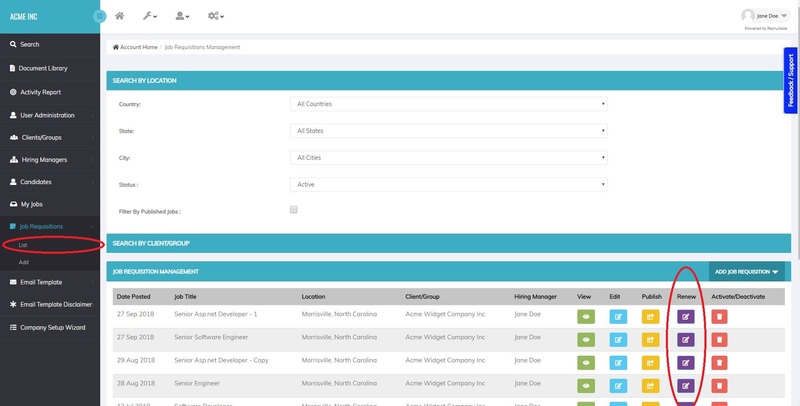 With Recruiteze, you can post jobs, manage your career’s page, track your applications, manage your candidate database, manage your notes and communication in one simple interface. 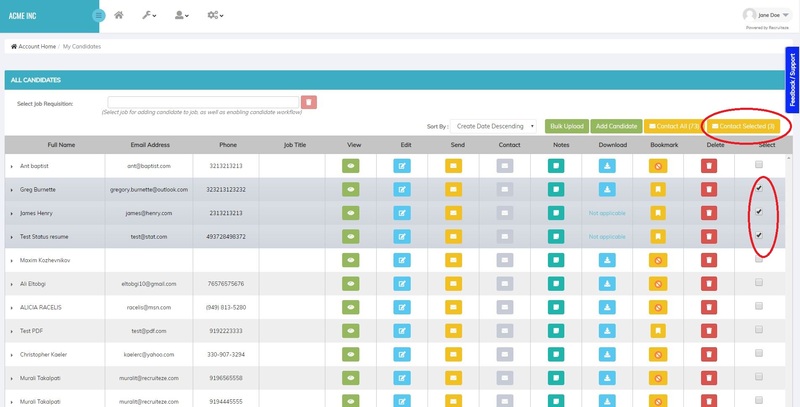 Recruiteze is the best small business applicant tracking system. Try Recruiteze for free today. Image below shows how the new/updated indicator is shown in a candidate list. The “New” indicator is added to all candidates received after August 25th, 2018 if you have not seen it already. The way it works, new indicator is displayed for all applications you have not seen yet. Also when another user in the organization adds a candidate, it shows up as new for you. Once the candidate is viewed, the new indicator is removed. The “Updated” indicator is shown besides candidates, who have been updated by someone else other than you, since you last saw the candidate. If someone else within your organization adds a note, contacts the candidate, updates the workflow, updates the candidate information or employment information. The “Updated” indicator is displayed for you, the next time you see the candidate. 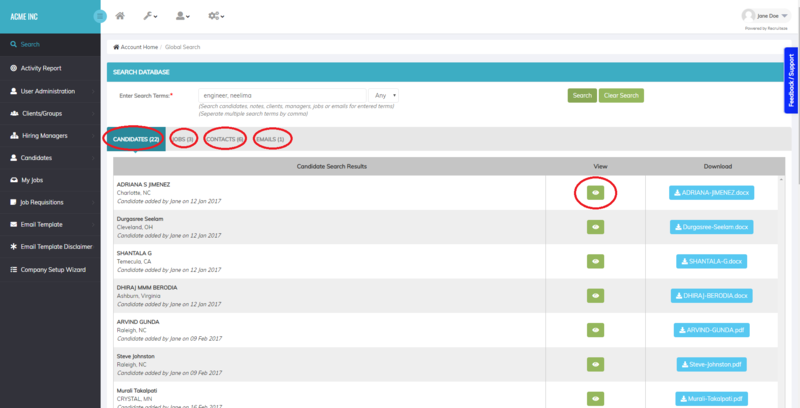 When you expand a candidate record, which has the “Updated” indicator, it will also show which information has been updated, by adding an updated indicator on the tab like shown below. 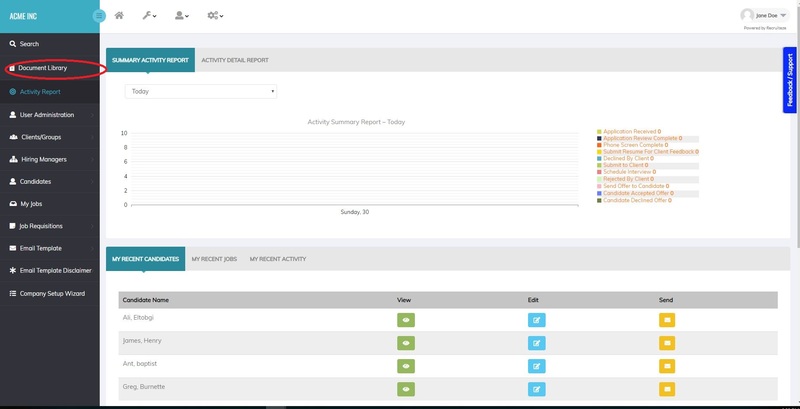 This is a feature, that will be very useful and interactive as you have multiple users working on the system. Thanks for being a valued customer and providing your feedback. If you have any questions/suggestions/feedback, send an email to support at recruiteze dot com. If you are looking for an applicant tracking system. Recruiteze is a simple small business applicant tracking system, with all the features you need to post your jobs, manage your candidates and applications, manage your notes and communication. Recruiteze is available from a browser, all you need is an internet connection.